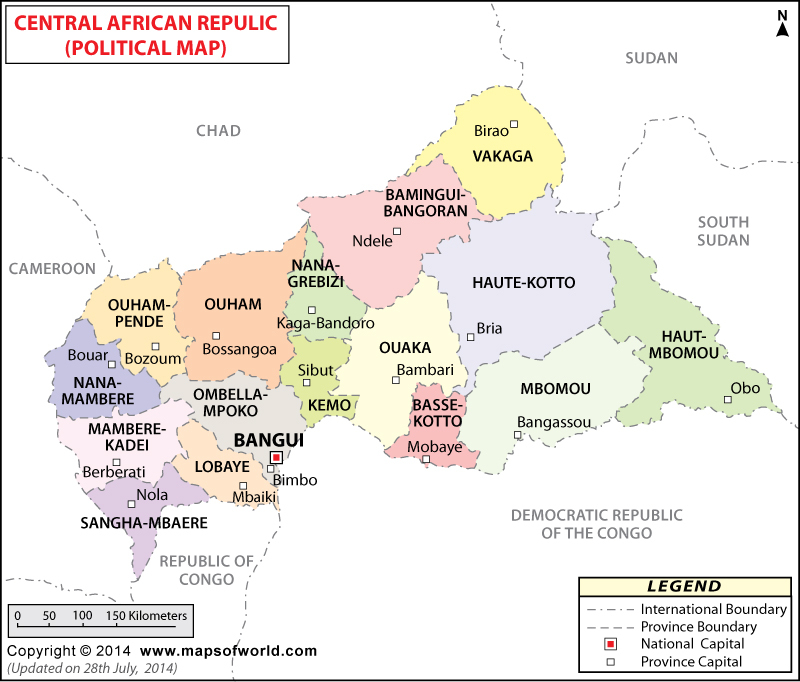 Bangui is the capital of the Central African Republic. Covering an area of 67 sq km and with an approximate population of 750,000 recorded in 2012, it is also the largest city in the country. Though archaeological sites going back to the Iron Age has been found here, the city of Bangui was founded by the French in 1889. They called it “Bongai” meaning rapids, after the rapids in the Ubangi River on whose bank the city is located. The country won its independence in 1958 but repeated political strife, mostly concentrated in the capital lead Bangui to be named as one of the most dangerous cities of the world. 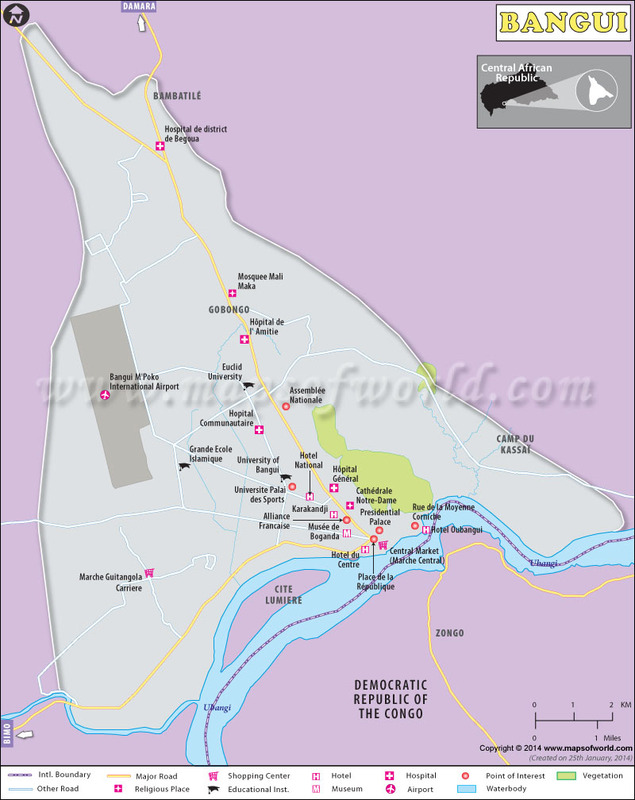 The city of Bangui is located on the northern banks of River Ubangi. The river forms a few steep rapids just before the banks. So, upriver navigation is seriously hindered in this region. The Ubangi River finally flows out to meet the Congo River. The region of Bangui is surrounded by lush green hills covered with tropical vegetation and it lies at an elevation of 369 ft.
One of the most interesting geographical features of Bangui is its magnetic anomaly. Due to the variation in Earth's magnetic field, Bangui magnetic anomaly causes uneven topography. Centered at Bangui, this magnetic anomaly has an ecliptic shape and as of now is the largest over Africa. ﻿ The city is located almost on the equator. So, it has hot and humid climate throughout the year and heavy torrential rain is not uncommon. In fact, parts of the city have often suffered from flood. The best way to reach Bangui is by flight. The city is served by the Bangui M’Poko International airport. Regular flights operate to a number of African cities including Libreville and N’Djamena. You can also reach Bangui by using the ferry from Brazzaville – the capital of the Republic of Congo. The ferry does not operate on weekends. The climate is too hot and moist for most of the year for comfort. The best time to visit Bangui is from December to February when it is slightly cooler and drier. The city of Bangui has seen repeated political turmoil and violence has become a way of life here. And the culture and tradition has strong native elements that date back to this era of violence. For example, polygamy is an accepted tradition in Bangui though it is not encouraged among women. It is true that most of the people are either Christians or Muslims; even then several tribal traditions are still followed. However, the city provides a perfect blend of Christian/Muslims and natives tradition. While we can witness native traditions even today; at the same time when it comes to festivities things are slightly variant. More specifically, few festivals are celebrated in the city and they mostly relate to the religious festivals of the Christians and the Muslims. The large triumph arch dedicated to Bokassa located near the river is the most important landmark of the town. In addition, you can also visit the archaeological sites surrounding the city which contains remnants from the Iron Age. More specifically, an archaeological survey was held in Bangui which revealed 26 deposits of the Iron Age as pendre-senge, Ngola Ndres, and Plateau-Cattin. Out of these deposits, the deposits at pendre-senge have been studied comprehensively. These sites were tentatively added to the UNESCO World heritage sites on 11th April, 2006. Whether you are for a business or a personal tour in Bangui, resorting to good accommodation options is mandatory. After all, while traveling a good and comfortable stay is something that we all eye on. Standard hotels are not plentiful in Bangui. By popular consent, JM Residences 2 and 3 are the best hotels in the city with clean good rooms with air conditions. The Ledger Plaza hotel offers a high standard of room and services.